One of these let me know of a new (and incredibly exciting) production of Miss Saigon due to arrive to our lovely little London town next year at the Prince Edward Theatre. Now this is rather double edged news. Why I hear you say, how can Miss Saigon coming to the West End be in any way a bad thing?! Well I shall tell you now my dear reader chum (casual Miranda steal), since it will replace a completely wonderful musical detailing the fascinating life of Frankie Valli & The Four Seasons. Jersey Boys has been at the Prince Edward theatre for 5 sellout years and was another Olivier Award winner (best new musical 2009); the unmissable sign that greets you as you wander past Shaftesbury Avenue will be sorely missed in my opinion. I went to see this a while ago with my parents as a late birthday treat; despite it being my birthday of course Mum had to approve the choice of show. 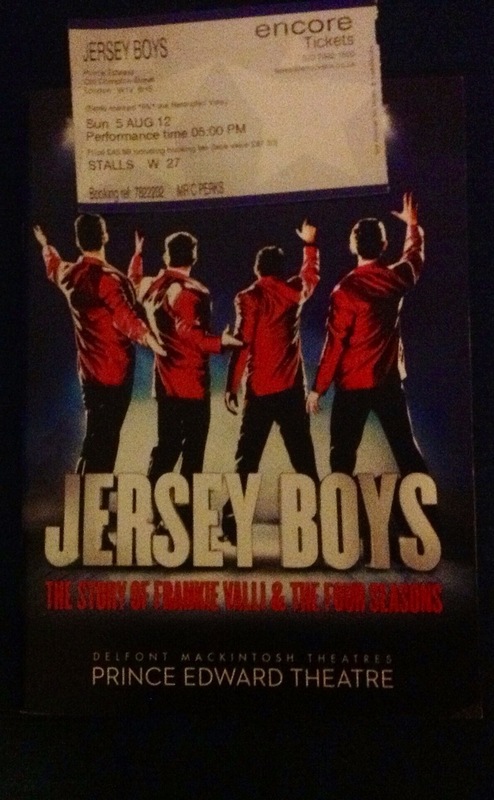 Now, Frankie Valli is one of her favourite artists so I felt pretty safe here! We went along to the Prince Edward theatre, a wonderful space that has housed some truly superb productions – 9 years of Evita in the ’80s, 5 years of Mamma Mia in the late ’90s and 1,000 performances of Mary Poppins in the ’00s ain’t half bad really! This is another great West End theatre, one of the larger in the Delfont Mackintosh group whose interior still sparkles like a newly renovated facade despite 20 years since the work was done. I haven’t even mentioned the production yet, and what a production! Absolutely outstanding in his role was Ryan Molloy (playing Valli) who interacted perfectly with his 3 co-leads and whose singing was a truly authentic representation of Frankie’s unique voice. Knowing a small amount about singing, I was completely blown away by his ability to keep perfect tone and pitch in his falsetto for the whole way through the performance – very tricky to do and even more tricky when considering you would be compared to the great Frankie straight away. Mum and myself were having a whale of a time singing along to all the songs that we both knew, which was more than I thought tbh; even the youngest, most trendy of teenagers would be surprised at how many of their songs have seeped into modern popular culture (Beggin’ was not composed by Madcon in 2008 shock horror!). Final point to mention is how cleverly the set is conceived. Whilst not evoking a ‘setgasm’ from myself I was very impressed at how the design was clearly constructed to move around the action and not vice versa. Case in point, the Four Seasons perform a song facing you as if at a live concert and then suddenly the set revolves to position the real audience behind the singers, as if we are backstage watching them perform to thousands of fans and feeling the adrenaline surge that comes with that kind of large scale live performance. Very clever indeed. Just talking about it now with my flatmate caused her to break out into song and do a little dance, and she is HARD TO PLEASE so it must have been a good musical! Word of the day – timbre. Ooh how musical am I with my words!